A face cream that helps reduce the appearance of fine lines and wrinkles, plus a serum containing a powerful, wrinkle-fighting peptide complex and a moisturizing oil that leaves skin feeling petal-soft. Radiant Precious Oil Drops — Apply a couple of drops over clean face morning and/or evening. Avoid direct contact with eyes. 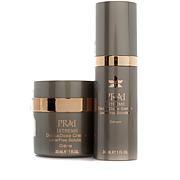 Follow with your preferred skincare regimen. Radiant Gemstone Caviar Triple Matrixyl Serum — Smooth over cleansed, toned skin, twice daily. 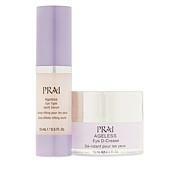 Radiant Creme Advanced with Matrixyl Morphomics — Apply over clean face skin morning and/or evening. Use alone or after your preferred serum. Matrixyl, Matrixyl3000 and Matrixylsynthe'6 are registered trademarks of Sederma, Inc. Ingredients: Aqua/Water/Eau, Propylene Glycol, Cetyl Alcohol, Squalane, Dimethicone, Cyclopentasiloxane, Butyrospermum Parkii (Shea) Butter, PEG-100 Stearate, N-Prolyl Palmitoyl Tripeptide-56 Acetate, Tourmaline, Amethyst Powder, Nephrite Powder, Ruby Powder, Pearl Powder, Coral Powder, Amber Powder, Glyceryl Stearate, Diamond Powder, Polymethylsilsesquioxane, Caprylyl Glycol, Ammonium Acryloyldimetyltaurate/VP Copolymer, Aluminum Starch Octenylsuccinate, Mica, Silica, Zingiber Cassumunar Root Oil, Xanthan Gum, Pentylene Glycol, Tocopheryl Acetate, Tetrahexyldecyl Ascorbate, Retinyl Palmitate, Tocopherol, Phenoxyethanol, Ethylhexylglycerin, Fragrance (Parfum), Amyl Cinnamal, Benzyl Salicylate, Citronellol, Hexyl Cinnamal, Butylphenyl Methylpropional, Limonene, Alpha-Isomethyl Ionone, Titanium Dioxide (CI 77891). Ingredients: Aqua/Water/Eau, Propylene Glycol, Glycerin, Cyclopentasiloxane, Cyclohexasiloxane, Polyacrylamide, Butylene Glycol, Palmitoyl Pentapeptide-4, Palmitoyl Oligopeptide, Palmitoyl Tetrapeptide-7, Palmitoyl Tripeptide-38, C13-14 Isoparaffin, Caprylyl Glycol, Dimethiconol, Silica, Mica, Laureth-7, Carbomer, Polysorbate 20, Hydroxypropyl Cyclodextrin, Zingiber Cassumunar Root Oil, Benzimidazole Diamond Amidoethyl Urea Carbamoyl Propyl Polymethylsilsesquioxane, Amethyst Powder, Tourmaline, Nephrite Powder, Ruby Powder, Pearl Powder, Coral Powder, Amber Powder, Fragrance (Parfum), Amyl Cinnamal, Benzyl Salicylate, Citronellol, Hexyl Cinnamal, Butylphenyl Methylpropional, Limonene, Alpha-Isomethyl Ionone, Titanium Dioxide (CI 77891), Red 17 (CI 26100). No instant gratification. I'll have to wait and see.